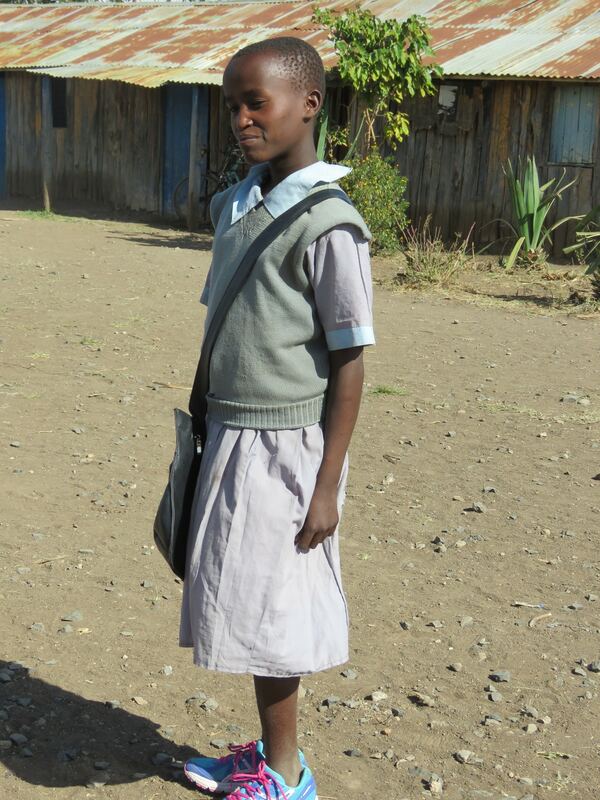 Standing outside of Matanya Primary School, Nancy is overjoyed with the gift of shoes and a book bag. Our tires sputtered over rocks spewing them wildly onto the dust filled road behind us. The sun had set long ago. Our stomaches ached for food – but our day could not yet release us. We navigated through a maze of barbed wire fences and and sagebrush. One direction looked the same as the next. But we were on mission. Just two weeks earlier we discovered Nancy, a 7th grade orphaned girl who was rejected by her own family and then sent away from an orphanage because it closed. Nancy has courage. She has a dream to learn and to be “someone” (as she puts it) in society. She should know, she is already one exceptional human being! Maybe you read about her on our blog. Tonight, we were driving to see Nancy. To see where she lives. To bring her food. Earlier today, our car broke down just 500 kilometers from school. We could not give up on visiting Nancy in school. We just couldn’t. With bags in tow, we exited our vehicle. The wind whipped our faces; dust blew everywhere. It was colder than we had anticipated. But we had no choice. If we were to see Nancy, we would have to walk. Mr. Mugo came to our rescue. His old pick up was a welcome sight! 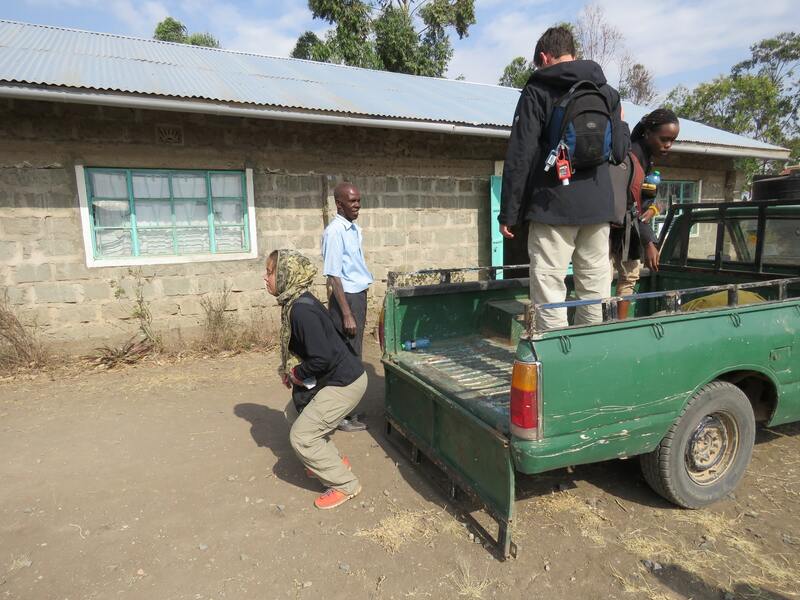 After looking at our car and making arrangements to cure it’s ills, he drove our team to Matanya Primary. A few days back, Quincy’s family eagerly sponsored this brilliant child. With our car back in working order, I think you could feel the excitement as we rolled to a stop in front of Nancy’s compound. 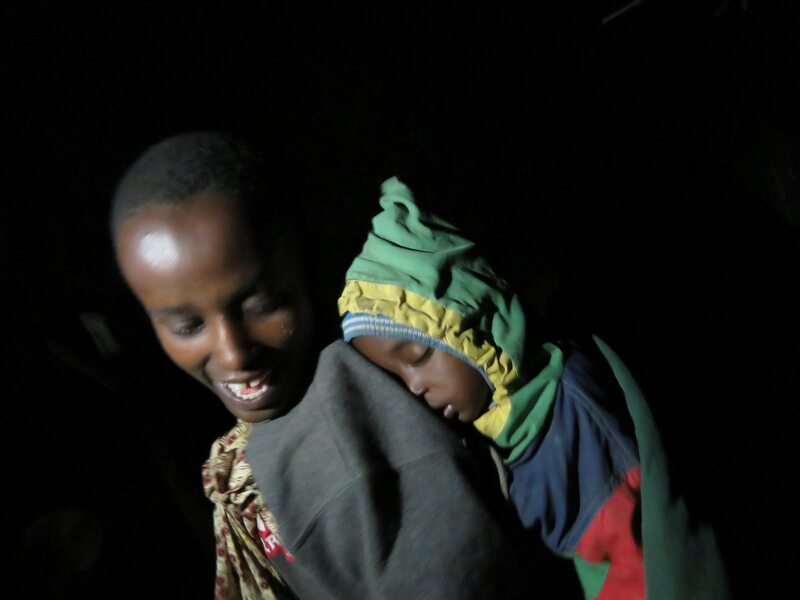 Now, one of 7 other children, Nancy resides with her aunt in a small, wood and mud structure. There is rarely time to study. Nancy must meet the demands of fetching water from a near by river, caring for the younger children and fetching firewood for the family’s warmth and cooking needs. She trades schedules with her cousins, sometimes cooking…sometimes washing dishes, utensils or the old garments we may use for rags, but they use for clothes. Nancy was adorned in a well worn but still brightly colored fabric. Underneath, her baby cousin Moses slept on her back. He snored rhythmically in the peace of the evening breeze. Our mission team rushed out of the small doorway of our car – we were all so eager to see Nancy again! The blackness of night required our unaccustomed eyes to shine our flashlights on the dusty path before us. We walked one by one to Nancy’s home. I don’t know how we managed to hold back tears as we entered the small mud and wood structure. Nancy beamed. “This is my home”, Nancy told us. “Here is where I study”. A small wooden table atop a hard dirt floor was her desk. She sat down and showed us her books – books we’d given her a few weeks ago. “Do you want to see where I sleep?”, Nancy asked. “Sure! Yes!” We replied. We each followed Nancy through a small opening in the wood and mud hut. What we entered may not be able to be adequately described. Hanging clothes cluttered several random lines strewn about the low ceiling. Nancy pointed through the darkness to her bed. “Five of us sleep here” she said. We wanted to gasp but held back our shock. Five of them! Five bodies laid in that smal bed? How!? Yet Nancy spoke with joy. She spoke with love. This was her home. Our cameras clicked. I don’t know about the others, but I felt ashamed. How do I take pictures? Yet how do I explain this without the visual images? We celebrated Nancy and all she showed us with her. Even when we discovered the family of chickens sleeping under her bed, we brought our focus on the joy of being together. With that, we slipped through the curtain dividing the dirt doorway from the sitting room. There, Quincy sat next to Nancy on the one small couch. Quincy told Nancy she loved her and confirmed her family’s support. “You won’t have to worry about school fees anymore. Just work hard and reach for your dreams.”. My mom and baby sister made you a video. 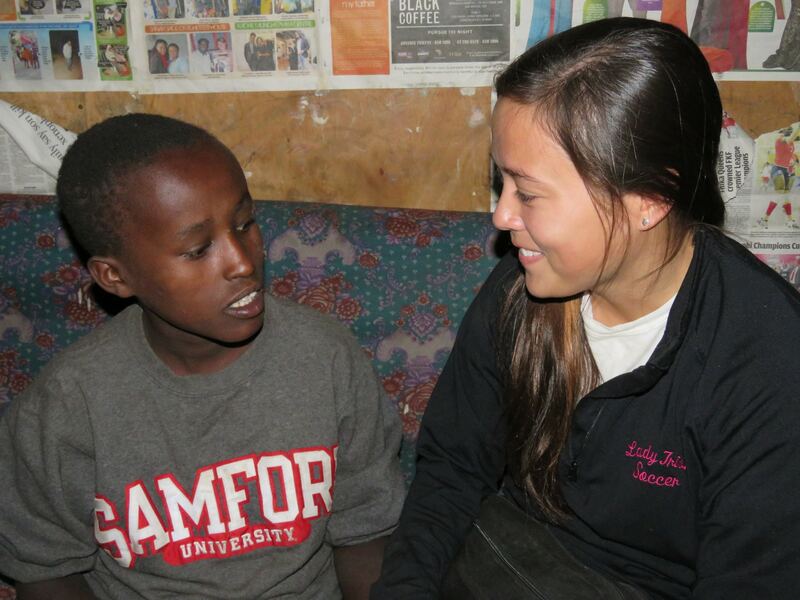 We love you and we want to support you through school.” I watched Nancy fight tears. I was fighting then myself. We took photos and shared stories and dreams. 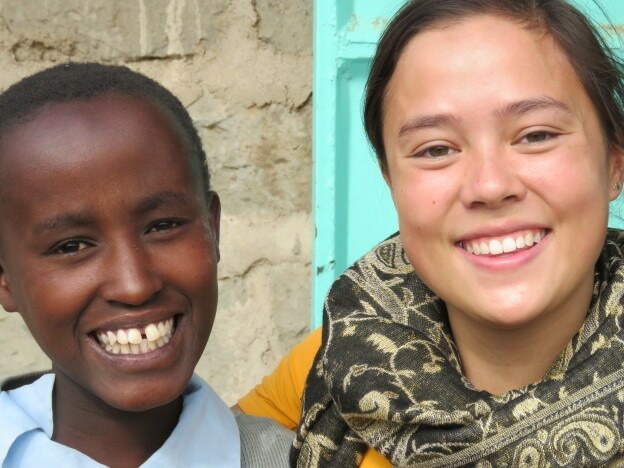 But most of all, we shared hope…hope made possible by saying yes to sponsorship. In this case, by saying yes to Nancy. Thank you McKown family for this magnanimous gift of love. 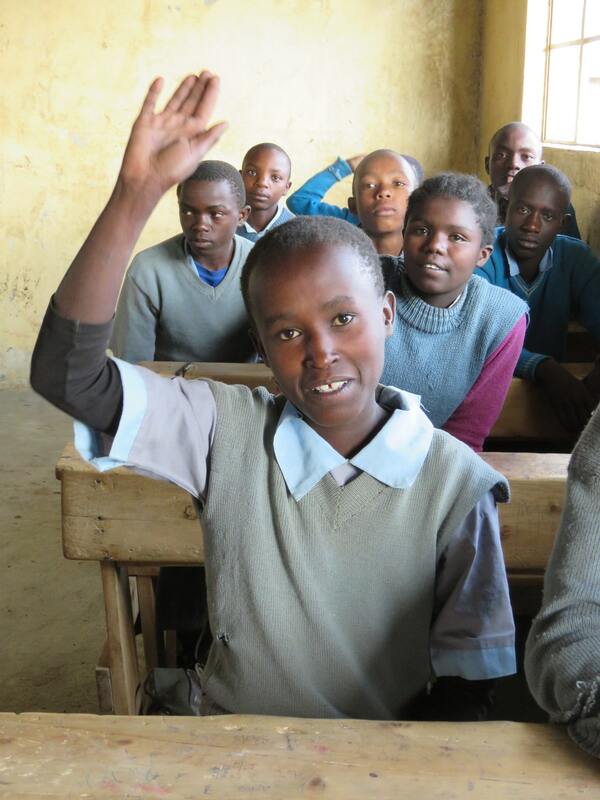 Nancy in class at Matanya Primary School. This entry was posted in MISSION 2015 on July 25, 2015 by Michelle Stark.